At 1.05 pm she tried again and yes ... the next door opened for us. Now, walking up to the 4th floor (I think) we were only a few steps away from Madame Piaf. Greeted by Bernard Marchois and Edith's singing ... “Allez, venez, (Olga) Milord! ...” felt a bit more than a coincidence to me. At first I was in a kind of shock. Unable to focus, my “merry-go-round” eyes travelled around the room touching all that once belonged to this great singer – sensing its energy rather than seeing the details. At some point I found myself lost in someone's past. Upon entering the second room, I could feel my chest overflowing with emotions and so I went back to the other room to retrieve a packet of tissues from my bag. As I leaned forward, a waterfall of tears with the sound from my grieving chest was beyond my control. “Est-ce l'émotion?” ... asked Bernard in a very unemotional tone of voice. Together with the tissues I pulled out of my bag a small present for him, that I nearly forgot about. When he thank me for a nice gesture, I felt a need to re say that it wasn't from me, but from Edith (through me). 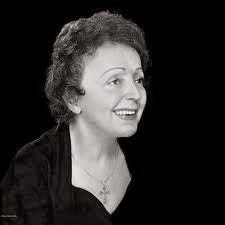 *Edith Piaf was very fond of Ginette Neveu. 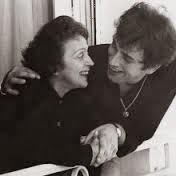 Ginette and Marcel Cerdan were travelling on the same plane to the USA when it crashed, killing everyone on board. The story behind the idea of this gift is not quick to explain and it goes back to the year 2010 with the final touch taking place only a few weeks before my departure. ... her famous little black dress, the cross (necklace) that she would never perform without, the shoes to fit her tiny feet, a huge teddy bear (received as a wedding present from Theo) together with a much, much smaller monkey seated on the bear's lap and a collection of porcelain plates among many other items on display. Our time was over at 1.30 pm as the next group of people came through the door. The whole visit felt like a fleeting moment, and the dream that became a reality felt like a dream again. My next destination was Pere-Lachaise cemetery, but not before having something to eat first. On my way back to the Cafe Menilmontant I got side tracked by a contemporary jewellery store. Well, I am a woman after all and I wouldn't dare to disappoint my friends who filled my Parisian piggy bank for a self chosen birthday gift. Not expecting to actually make a purchase as yet, I was surprised to find something that had my name on it. To prevent a potential let down on my behalf to my female readers, I have decided to included a photo of the “hard to resist” ring and earrings with cat's eye and amethyst stones. Now I was back at the cafe, which was much busier at this time of the day. While enjoying my delicious vegetarian lasagne with a goat cheese and another espresso (which I can not hide), I tuned in to a quiet chatter floating in the air occasional interrupted by a sound of “cutlery versa crockery”. I felt so at home. Before catching the metro, I popped in to a local florist to buy some flowers for Edith. From what was available, I chose two bunches of pale pink roses and and a bunch of (believe it or not) yellow wattle*. In my opinion, a touch of native wild Australia seemed to complement very nicely the bouquet of tamed roses. I am sure Edith would like it too. *Golden Wattle is formally adopted as the Floral Emblem of Australia. Upon reaching the gates of the cemetery I was greeted by a sign with a message of closure to visitors until further notice because of the weather conditions. If she only knew that I also came all the way from Australia. With the flowers in one hand and umbrella in the other taking photos was out of question.A trip back to my appartment was a must and then ... Lets see. A stroll along the Avenue des Champs-Elysees and a visit to the top of the Arc de Triomphe sounded like a great idea! Before catching a metro I stopped to buy a local paper as a souvenier. “Vous devez rigoler quand il neige.” (You need to laugh when it snows.) ... were the vendor's words as I gave him the coins. “Charles de Gaulle Etoile” ... this was my stop. Up and out following the crowd I found myself on the familiar path. “Arc de Triomphe closed due to the weather” ... Was I suprised? Disapointed “yes”, but suprised “no”. Dusk was around the corner and the snow kept falling down as I began my “memory lane” stroll. It was interesting to see that despite the weather many cafes had their outside little tables and chairs set up as usual only to be covered by snow. Who was going to be game enough to sit in “minus degrees” fresh air?! I guess some men are hot! As I got closer to the first roundabout I recognised a cafe across the road. Yes, this is definitely the one. The one where I had a cup of coffee back in July 1982. Surrounded by dusk with a fifth coffee under my belt I made my way to the nearby Franklin D. Roosevelt metro station. It was time to go home. By now Place Pigalle was covered in the darkness of an evening sky reflected in white snow beneath my feet. I was hungry and looking forward to a yummy meal. A “Festivo & Co” restaurant (see link at the end) across from the earlier mentionned pattiserie was open and looked inviting. I picked a table next to the heater. The more warmth the better! Being pescetarian there were two items on the menu that caught my attention. Approached by the waiter (who appeared more like an owner) I asked which fish of the two was tastier. It was fun sitting, sipping wine and observing life as it happened inside and outside the restaurant. There were friends sharing a meal, middle aged men having their dinner with a glass (or more) of wine and the newspaper by their side, as well as a lady from a shop up the road* having a glass of wine and a chat before heading home (I guess). *I saw her a few days later working in one of the shops. The snow kept on falling and the heads of people without umbrellas were decorated with a gentle layer of snowflakes shinning under the street lights while the white mounts on their shoulders reminded me of Napoleon's epolets. My first full day in Paris was nearing its end with a beautiful steamed fish, wine, the sixth and last espresso ( no more) in a company of the local people. Even if you are on your own you are never alone. At least not all the time and the moments spent in your own company are equally valuable. They are the yin and yang of our lives. Please note that alone is different to lonely – one can feel lonely while in a presence of colleagues. Back in my 6th floor abode (aha ... one espresso for each floor) I was reflecting on the day's events while waiting for a heater to create a bedtime temperature. It all still felt like a dream and there was no one to pinch me. It was 10.30 pm and I started to feel tired and ready for sleep. Cuddled by the warmth of my two heat packs brought with me just in case, I gazed at the Parisian sky before falling into a deep sleep together with all the snowflakes. 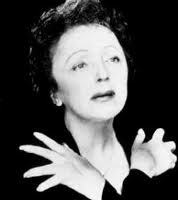 Song "A quoi ca sert l'amour"
Other photos of Edith Piaf from the Google search "images for Edith Piaf"